The S&P 500 was up 0.83% on Thursday. It is up 3.22% from the bottom of the recent range and it’s down 7.27% from the top. The market looked better than it was because Boeing rallied 3.1% which pushed the Dow up 1.21%. It’s silly to give Boeing so much importance; it’s stock has the highest price in the Dow which is a price weighted index. If Boeing was to make a new all-time high, the Dow likely would too. The financials did the best as the sector was up 1.82% as the bank earnings are approaching. This is good sign for the market as bulls hope stocks react positively to a solid quarter of results. JP Morgan, Citigroup, and Wells Fargo report earnings on Friday. They will set the tone for the sector. Last year, investors were confused why stocks didn’t react to the news coming out of the White House on a daily basis. It appears the market has changed as it has started caring about the news. Either the market suddenly cares or the news items are distracting investors from the truth which is stocks are falling because the economy is weakening. I think the truth is a combination of those two options. Sometimes the news is an excuse for traders react and other times it drives the market. The latest news from the White House is Trump clarified his previous point that the U.S. wouldn’t necessarily attack Syria. The other important news event was President Trump asked his advisers to look into re-entering the Trans Pacific Partnership. This shows that everything is on the table with this administration. Anything from a trade war to free trade with all nations is possible. This is actually good news for the market because stocks have recently been pricing in the negatives without acknowledging the potential positives. In a previous post, I mentioned that the government debt hasn’t been an issue for stocks and probably won’t be until the interest payments start to increase enough that they prevent other expenditures from being made. As you can see from the chart below, the entitlement and interest expenses as a percentage of GDP are expected to cross above 30% by about 2042. These are just estimates as the interest rate in 2042 is impossible to predict. To be clear, entitlements are social security, Medicare, and Medicaid. 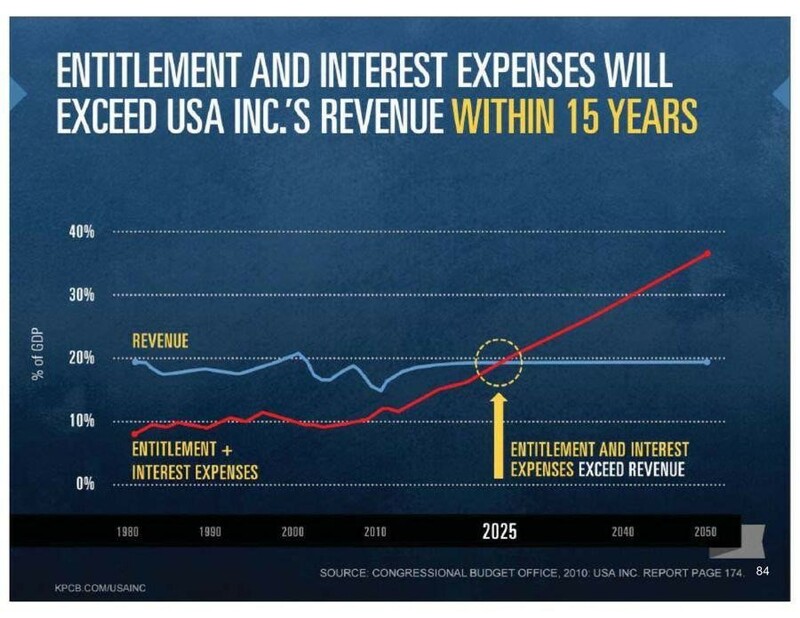 Ultimately, this analysis is simplistic because changes can be made to adjust entitlement spending such as raising the age of retirement. I’m skeptical of any charts which have an arrow going straight in one direction. The point I’m making by showing this chart is this dire scenario would be an example of one which would hurt stocks in the future. The Shiller PE is 31.66 which is still extremely high as it’s only a couple points off the recent peak. The chart below shows the real S&P 500 earnings since 2008. As you can see, the earnings were below $60 per share for over a year. If earnings reach anywhere close to the expectations in the next 2 years, the Shiller PE will fall a lot. The question is if this makes stocks truly less expensive because the multiple is supposed to be cyclically adjusted. To be clear, the earnings in 2009 were particularly bad. Secondly, even after the Shiller PE falls, it will still be higher than the median and the average. One other point is stocks perform poorly when the Shiller PE is high and falling, but this situation will be different than usual because the earnings will be catalyzing the decline instead of stocks falling. That indicator works because stocks usually follow trends and they have a lot of room to fall when they are expensive. It’s amazing to see that this extremely long cycle is about to ‘break’ the Shiller PE which has data going back until the 1880s. With the weak BLS report from March and the spiking jobless claims last week, some analysts wondered if the labor market was softening. 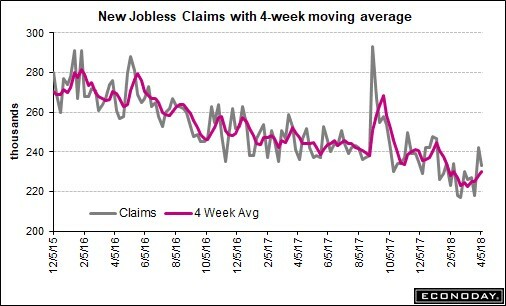 I mentioned last week that the jobless claims may have spiked because of the holiday shortened week. My prediction was that the claims would fall next week. That was an accurate forecast as the claims fell by 9,000. As you can see from the chart below, the claims went from 242,000 to 233,000. That was 3,000 above the consensus. The 4 week moving average increased from 228,250 to 230,000. The 4 week average has increased several times in the past 2 years. It’s tough to gauge this indicator because it’s already at a record on a labor force adjusted basis. You would think it can’t go much lower than where it’s at now, but it might continue shocking analysts. I have been discussing the technology sector the most in my articles because it is the largest one. I’ve suggested that the tech sector should be broken up to balance out the market. That’s exactly what is happening as a few firms are moving sectors. 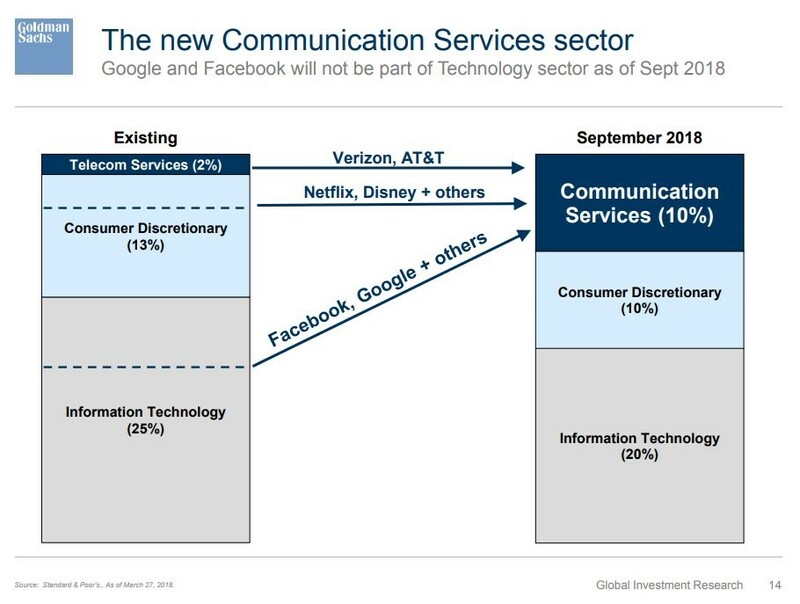 As you can see from the chart below, Netflix, Disney, and other firms are leaving the consumer discretionary sector and entering the communications services sector. That’s the new name for the current telecom sector. It made little sense to have an entire sector of the S&P 500 with just two firms, AT&T and Verizon. That change is shrinking the consumer discretionary sector and enlarging the communication services one. The other change is Facebook, Alphabet, and others are leaving the information technology sector and entering the communication services sector. This will shrink the tech sector and enlarge the communications services sector. This is a good idea because the tech sector doesn’t make sense the way it’s constructed. Back in the 1990s, firms with a website were considered part of tech, but now every firm has a website and they all utilize technology such as the cloud to drive their businesses. Facebook and Alphabet aren’t tech firms like semiconductors are so they are leaving the sector. Since a lot of the firms moving sectors have great earnings growth expectations, it means the tech and consumer discretionary sector performance will be hurt and the communication services sector should do well.